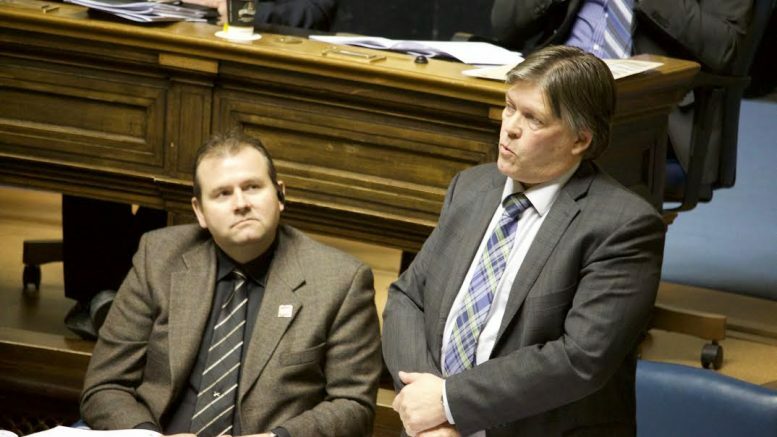 Education and Training Minister Ian Wishart speaks during question period March 9. Photo by Levi Garber. The Progressive Conservative government introduced legislation Monday that will lift a cap on post-secondary tuition in Manitoba. Bill 31 – the Advanced Education Administration Amendment Act – will amend legislation put in place by the NDP in 2012, removing the requirement post-secondary institutions tie tuition hikes to the province’s rate of inflation. The 2012 legislation followed a more than a decade-long tuition freeze. Bill 31 will allow universities in the province to hike tuition annually by five per cent, plus inflation. Last year, the rate of inflation in Manitoba was 1.2 per cent. Any tuition increases enabled by the legislation would not take effect until the 2018-19 academic year, and would not affect the Canadian Mennonite University. Education and training minister Ian Wishart introduced the bill just before question period Monday and said universities need the increases to compete with other modern Canadian universities. University of Manitoba president and vice-chancellor David Barnard said in a release the U of M will take advantage of the opportunity to increase tuition. “It is of critical importance that students in Manitoba have access to a post-secondary education at modern, well-equipped, nationally and internationally competitive universities,” he said in the release. Any tuition increases at the U of M must be approved by the university’s board of governors. In January, the PC government appointed 11 new members to that board. NDP education critic and MLA for Fort Rouge Wab Kinew spoke out against the proposed legislation during question period and said that any tuition increases will negatively effect lower-income students in the province. “When I was in the university system, I heard from low-income students that if you’re going to increase tuition by $1,000, you might as well increase it by $10,000 because it’s that much of a barrier to them,” Kinew told reporters following question period. Kinew worked as the first director of Indigenous inclusion at the University of Winnipeg between 2011-2014 and was appointed acting associate vice-president of Indigenous affairs for the U of W before running to represent Fort Rouge. “I think the Pallister government is out of touch with students and out of touch with working families in Manitoba,” said Kinew. The Canadian Federation of Students-Manitoba (CFS-MB) brought nearly 40 students to the legislature to witness the introduction of Bill 31. About half-way through question period, the students left the visitors’ gallery and began protesting in the foyer of the building, shouting various slogans protesting the proposed fee increases. The shouting could be heard from within the legislative chamber. The protesting students were then peacefully escorted out of the building. Students protest Bill 31 at legislature March 20. Photo by Levi Garber. CFS-MB chairperson Michael Barkman spoke with reporters following the small protest and said Manitoba students are saddened by the prospects of paying higher tuition. “Students are very disappointed and very upset with the news today,” Barkman told reporters. UMSU president Tanjit Nagra said she hopes the university will consider the range of challenges students have faced over the past few years when considering tuition hikes. Check back for additional details as the story develops.